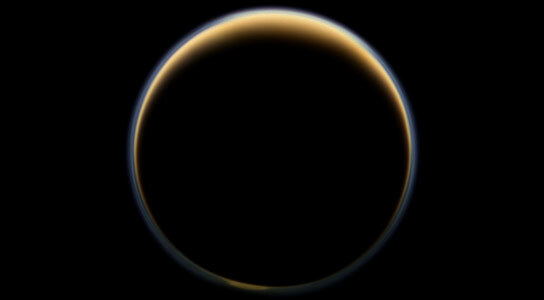 Data from Cassini’s visual and infrared mapping spectrometer has allowed researchers to confirm that polycyclic aromatic hydrocarbons (PAHs) play a major role in the production of Titan’s lower haze, and that the chemical reactions leading to the formation of the haze start high up in the atmosphere. Scientists working with data from NASA’s Cassini mission have confirmed the presence of a population of complex hydrocarbons in the upper atmosphere of Saturn’s largest moon, Titan, that later evolve into the components that give the moon a distinctive orange-brown haze. The presence of these complex, ringed hydrocarbons, known as polycyclic aromatic hydrocarbons (PAHs), explains the origin of the aerosol particles found in the lowest haze layer that blankets Titan’s surface. Scientists think these PAH compounds aggregate into larger particles as they drift downward. Of all the bodies in the solar system, Saturn’s largest moon, Titan, has the atmosphere most resembling that of Earth. Like that of our planet, Titan’s atmosphere is largely composed of molecular nitrogen. Unlike Earth’s atmosphere, however, Titan’s contains only small traces of oxygen and water. Another molecule, methane, plays a similar role to that of water in Earth’s atmosphere, and makes up about 2 percent of Titan’s atmosphere. Scientists have speculated that the atmosphere of this moon may resemble that of our planet in its early days, before primitive living organisms enriched it with oxygen via photosynthesis. When sunlight or highly energetic particles from Saturn’s magnetic bubble hit the layers of Titan’s atmosphere above about 600 miles (1,000 kilometers), the nitrogen and methane molecules there are broken up. This results in the formation of massive positive ions and electrons, which trigger a chain of chemical reactions, producing a variety of hydrocarbons — a wide range of which have been detected in Titan’s atmosphere. These reactions eventually lead to the production of carbon-based aerosols, large aggregates of atoms and molecules that are found in the lower layers of the haze that enshrouds Titan, well below 300 miles (500 kilometers). The process is similar to Earth, where smog starts with sunlight breaking up hydrocarbons that are emitted into the air. The resulting pieces recombine to form more complex molecules. This illustration shows the various steps that lead to the formation of the aerosols that make up the haze on Titan, Saturn’s largest moon. 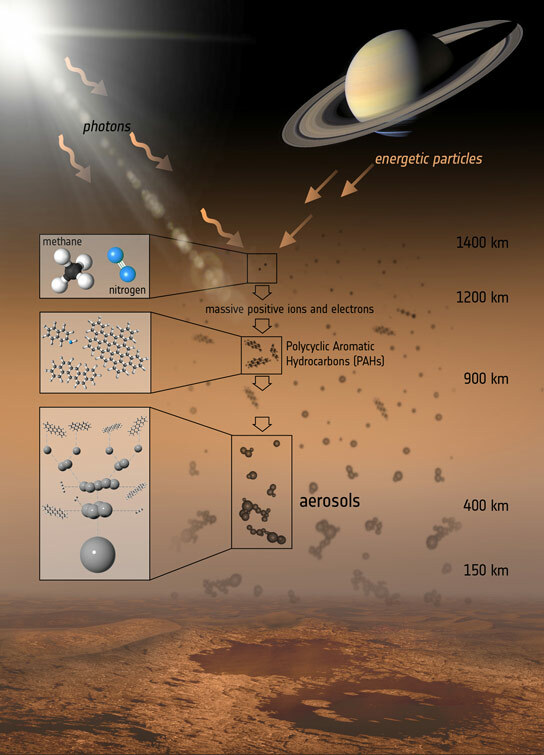 When sunlight or highly energetic particles from Saturn’s magnetosphere hit the layers of Titan’s atmosphere above about 600 miles (1,000 kilometers), the nitrogen and methane molecules there are broken up. This results in the formation of massive positive ions and electrons, which trigger a chain of chemical reactions that produce a variety of hydrocarbons. Many of these hydrocarbons have been detected in Titan’s atmosphere, including polycyclic aromatic hydrocarbons (PAHs), which are large carbon-based molecules that form from the aggregation of smaller hydrocarbons. Some of the PAHs detected in the atmosphere of Titan also contain nitrogen atoms. Aerosols in Titan’s lower haze have been studied using data from the descent of the European Space Agency’s Huygens probe, which reached the surface in 2005, but their origin remained unclear. New studies analyzing data from Cassini’s visual and infrared mapping spectrometer (VIMS) gathered in July and August 2007 might solve the problem. One new study of Titan’s upper atmosphere in the Astrophysical Journal describes the detection of the PAHs, which are large carbon-based molecules that form from the aggregation of smaller hydrocarbons. The team of scientists had been studying the emission from various molecules in Titan’s atmosphere when they stumbled upon a peculiar feature in the data. One of the characteristic lines in the spectrum — from methane emissions — had a slightly anomalous shape, and the scientists suspected it was hiding something. Bianca Maria Dinelli from the Institute of Atmospheric Sciences and Climate (part of the National Research Council) in Bologna, Italy, was the lead author of a related paper in the journal Geophysical Research Letters. She and her colleagues conducted a painstaking investigation to identify the chemical species responsible for the anomaly. The additional signal was found only during daytime, so it clearly had something to do with solar irradiation. “The central wavelength of this signal, about 3.28 microns, is typical for aromatic compounds — hydrocarbon molecules in which the carbon atoms are bound in ring-like structures,” said Dinelli. The scientists tested whether the unidentified emission could be produced by benzene, the simplest aromatic compound consisting of one ring only, which had been detected earlier in Titan’s atmosphere. However, the relatively low abundances of benzene are not sufficient to explain the emission that had been observed. After they ruled out benzene, the scientists tried to reproduce the observed emission with the more complex PAHs. They checked their data against the NASA Ames PAH Infrared Spectral Data Base. And they were successful: the data can be explained as emission by a mixture of many different PAHs, which contain an average of 34 carbon atoms and about 10 rings each. “PAHs are very efficient in absorbing ultraviolet radiation from the sun, redistributing the energy within the molecule and finally emitting it at infrared wavelengths,” said co-author Alberto Adriani from the Institute for Space Astrophysics and Planetology at Italy’s National Institute for Astrophysics (INAF) in Rome. He is part of the Cassini-VIMS co-investigators team and started this investigation. He manages the team that collected and processed VIMS data. These hydrocarbons also are peculiarly capable of sending out profuse amounts of infrared radiation even in the rarefied environment of Titan’s upper atmosphere, where the collisions between molecules are not very frequent. The molecules are themselves an intermediate product, generated when radiation from the sun ionizes smaller molecules in the upper atmosphere of Titan that then coagulate and sink. The Cassini-Huygens mission is a cooperative project of NASA, ESA and Italy’s ASI space agency. The Jet Propulsion Laboratory manages the Cassini-Huygens mission for NASA’s Science Mission Directorate, Washington DC, USA. The visual and infrared mapping spectrometer team is based at the University of Arizona, Tucson. The California Institute of Technology in Pasadena manages JPL for NASA. Be the first to comment on "Cassini Data Confirms PAHs Play Major Role in Production of Lower Haze on Titan"